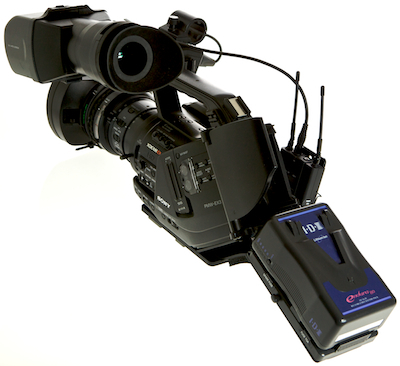 New EX3 Shoulder Brace and NanoFlash mounting system now shipping. Well I finally had time to photograph and set up my new shopping cart on the web. The whole EX3 kit is now done and back from the anodizer. I came up with a new shoulder brace design just for the EX3, I have been using a very similar design myself for almost 2 years now on my EX3. I find it very comfortable. With my IDX batteries in the back it feels like a real shoulder mount camera. And it sits flat on a table and just snaps onto my sticks. It also comes off real fast. And it can be used with my wing and NanoFlash arms. The Shoulder brace is $75.00. Very nice looking finished product Olof. I have a question about how the shoulder brace attaches. The whole assembly wouldn't fit into my case so I'd have to remove it for transport and storage. Is the shoulder brace attached using allen screws? and if so, what size? I'd like to see if I could find some thumb screws in that size that would allow me to quickly attach and detach the brace. There are 2 4mm - 8 screws that mount from the bottom of the plate. I supply the allen wrench with the kit. I thought about milling slots instead of holes, but I think the possibility of a disconnect with batteries NanoFlash power chord etc. is to big a risk. I spent quite a bit of time experimenting. I use a run-bag that is carry on size (at least the last time I flew in December), it is a PortaBrace smuggler. And the EX3 and the whole wing NanoFlash Dual IDX batteries fit in it easy, without disassembly . You may be using a smaller bag. It would be possible, very easily actually, to put 4mm studs into the shoulder brace and then use plastic (with stainless steel thread) thumb screws below the plate, or to make thumb screws that go into the brace. Give me a call (cel 603.387.4921) and we can discuss options. I am always looking for user input, I am a shooter myself. Thanks for your input, the more input i get the better I can make these products. I woke up this morning at 5AM and I was thinking about a small folding version of the EX3 shoulder brace. I have been emailing back and forth with Ryan R. about a smaller folding brace. And I was half dreaming when this Idea hit me. It is so simple it is stupid almost, it weighs a few grams, and is actually part of the padding when you put your cam in the bag. It is just high density foam velcroed to my brace, it comes off instantly and is really comfortable. It is made from kayak foam, the kind you use to make the inside fit you comfortable and snuggly. It is actually very rugged and it is inexpensive. I will refine the cut a little more and maybe attach the velcro to a piece of aluminum on the foam for longer wear and strong attachment. I really like the way the curves complement the EX3. I think the price will be $18.00. 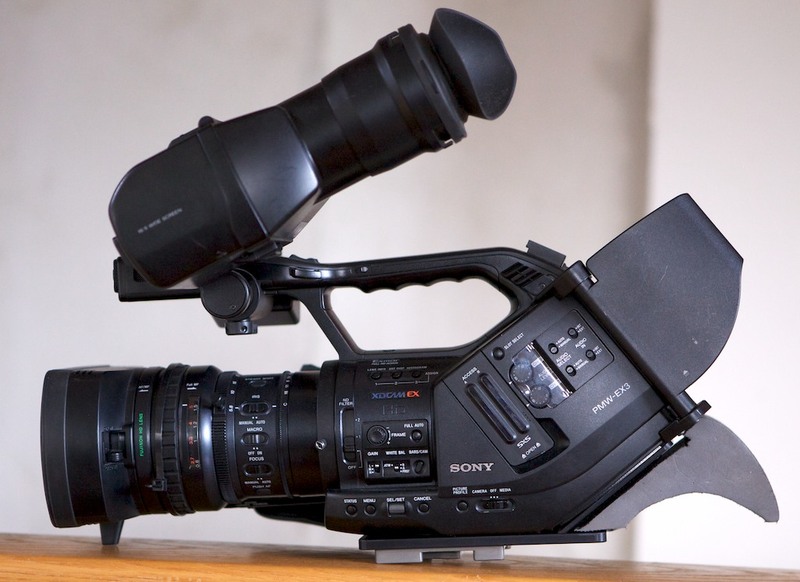 Olof - what is that large black plate sticking out of the rear of the EX3 - is that part of the kit? 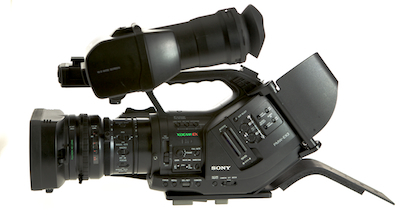 The hinged plastic on the back of the EX3 is the "chin plate". Sony ships this with all EX3's. But Sony does not install it. So I find a lot of people don't use it. I think it works really well. 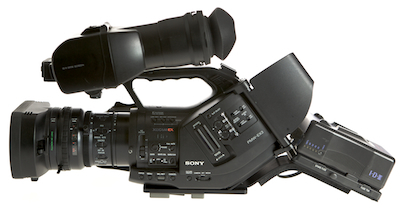 It makes another point of contact when shouldering the EX3. Especially if you use the built in Sony brace. It also folds all the way in to protect the video TC etc, connectors and battery when in your bag. And it folds all the way out to get good access to connectors. In these photos it is in the "shooting" position. With my brackets and Sony's built in, it helps steady the camera a lot when on your shoulder, kind of like a full size shoulder camera. 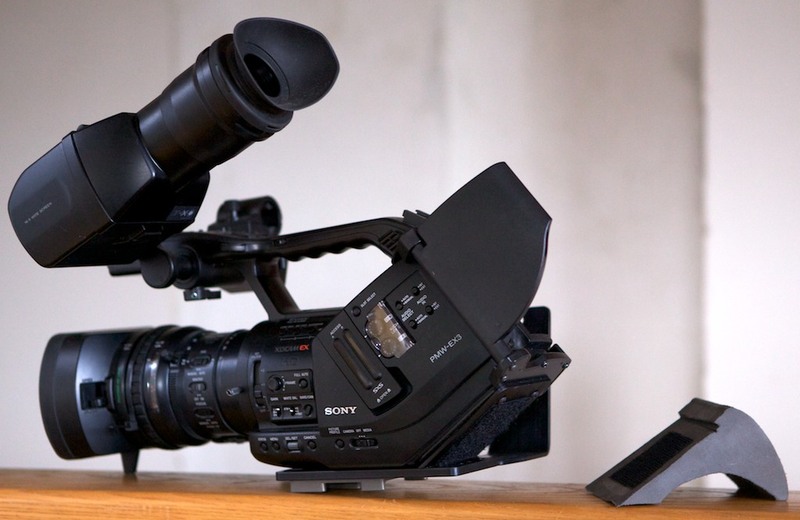 I find the EX3 with IDX batteries in the back of my bracket to be a very balanced and comfortable shoulder rig. And much lighter than a full size cam. And with the EX3 you have a great selection of lenses. Don't get me wrong, I really like my EX1R but for shooting on the shoulder for long periods, like roaming around a sport event I usually grab the EX3, and the NanoFlash on my wing system. And the EX3 will run for more than 10 hrs on a couple IDX batteries in the V-mount plate, including powering the NanoFlash and an on camera light. Yes when you install my Stronger EX3 plate system you remove the Sony Pad and extension arm. I always found that fairly useless and uncomfortable except for a very quick shoot. I think my new "Foamy" is much more comfortable. But for extended shoulder shooting I always use my new shoulder brace. Here ia a shot of my original setup on my EX3, I made this over 2 years ago. And I have been using it up until now, when I made the improved production version. As you may notice I was using the same foam as my new "Foamy" shoulder pad, and an IDX plate for batteries. BTW I will soon have my 15mm rail system ready including a handy palm rest for the left hand. And I will be selling matte boxes and follow focus as well. Now this looks like it has potential even without the brace. I'lll bet you could size/adapt it so it would replace the pad on the extender built into the EX3... just remove the rubber pad from the metal part of the extender, then put your pad where the factory one was. You could probably sell a bunch of those if you kept the price under $50.00. Does the foam only come in that color, or can you get black? Still love my slider, BTW. You sound a lot like me. Once I get thinking about something I get obsessed with it. I like the idea of the smaller compact shoulder mount but also am looking to get more weight over the back. The shoulder brace you had come up with in your finished product would probably be what I would be looking for but as I said I'd have to figure a way to transport it. I use a Pelican 1600 (somethingish, can't recall the exact number) case. Sorry I couldn't call you earlier but I've been rushing to get an edit completed. If the cost is low enough I would actually consider getting both. I could see situations where having a longer extension on the back could be in the way in crowded situations but could be very useful for longer hand held situations. I'd still be interested in some kind of quick removal method for your original shoulder brace. I'll try to get in touch with you tomorrow if that's ok. If not let me know a good time to talk. I will be around tomorrow, give me a call. Try my cel if the office does not work, 603.387.4921. I just made another small "foamy" I don't think I will need a metal plate on the back of it. I just tried a new type of glue on the velcro. This would mean a price of $18.00. I can think of a few ways to make quicker removal / mounting of the large brace. Give me a call and we can discuss options. Depending on what tripod you use we may be able to use thumb screws. I always try to keep the bottom flat, thumbscrews defeat this aim. I just got my brace for the Ex-3 and Olof I must say it is outstanding. The only thing I find troublesome is that it cannot be quickly removed. However it fits so good I really don't see a need to remove it except for the extension where the external battery fits. If my case would allow it I would never have to remove it. Also I tried to install the cheek pad and found that it would not fit my pelican formed case for the Ex-3 with or without the brace installed. The thumb screws you are sending will help me in assembling and dis-assembling the brace before and after my shoot. Thanks so much for such a very refined quality product..... so keep those ideas for the Ex series coming. 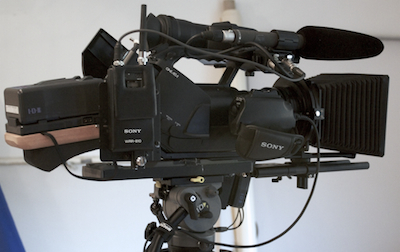 I plan to be at NAB and hopefully get to meet you in person. I got my bottom plate and shoulder mount for my EX3 also and was able to do some tests this weekend. I'll be giving it a thorough workout on April 3rd when I'll be shooting a horse training clinic as part of a commercial I'll be producing. As for my impressions so far they are very good. The bottom plate is a huge improvement and I was finally able to get the balance I needed on my Sachtler tripod. The shoulder brace works out nicely and like Ronnie I am awaiting the thumb screws to make assembly of the shoulder brace a quick field operation. I was very surprised at how light the entire unit was and how much it helps with the overall balance of the camera to get my battery back over my shoulder. Thanks Olof. When I get a chance I'll post some pictures of my setup. weight increase was the added weight of the v lock battery which is needed and welcomed in my shooting situation. I shoot racing video and usually from a high position. The Ex-3 using the stock shoulder attachment is nose heavy and by the end of the event my lower back is killing me along with my right shoulder and right arm. Next weekend I will be able to give a report on how the brace helps my poor old tired lower back. One more question: Anyone know if you can stack a stock Sony V mount batter on top of one of the IDX batteries that have the stacking v mount for the IDX battery? 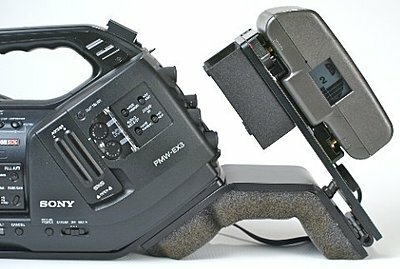 That would allow me to purchase only one IDX battery and at the same time add a little more weight to the back of the EX-3. Thanks again to Olof for the brace. 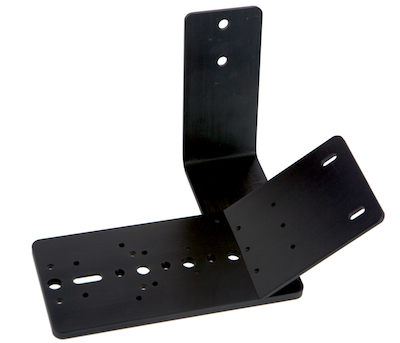 I was just talking with Jeff DeMaagd at DM-accessories.com - he has been continuing to improve his mounting plates. I'm particular to the one with the folding section that is ready to accept an AB or IDX battery and a wireless receiver.